Rainbows have been forever a special symbol and of significance to people all over the world. 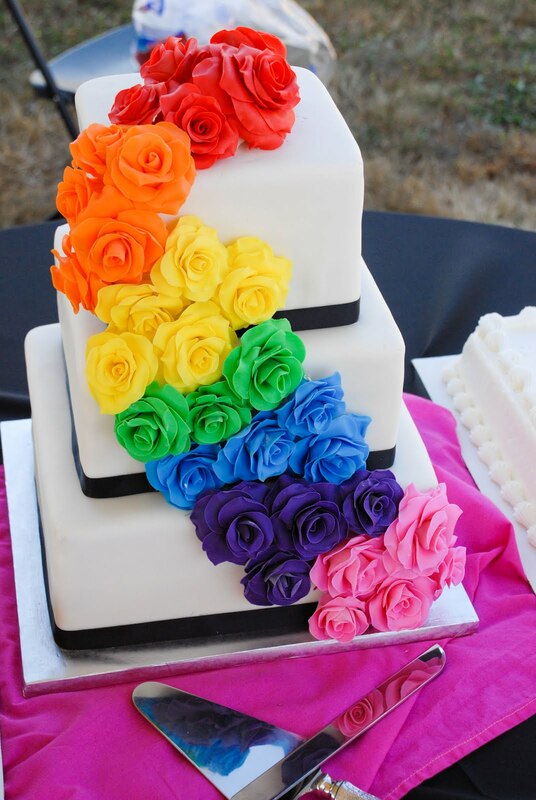 So a rainbow wedding theme is a lovely way to start your new life. Whether it be a religious, Irish, Gay or you just love the song "Somewhere Over the Rainbow" from the wizard of OZ a rainbow theme has a lot of possibilities for you to expand on. 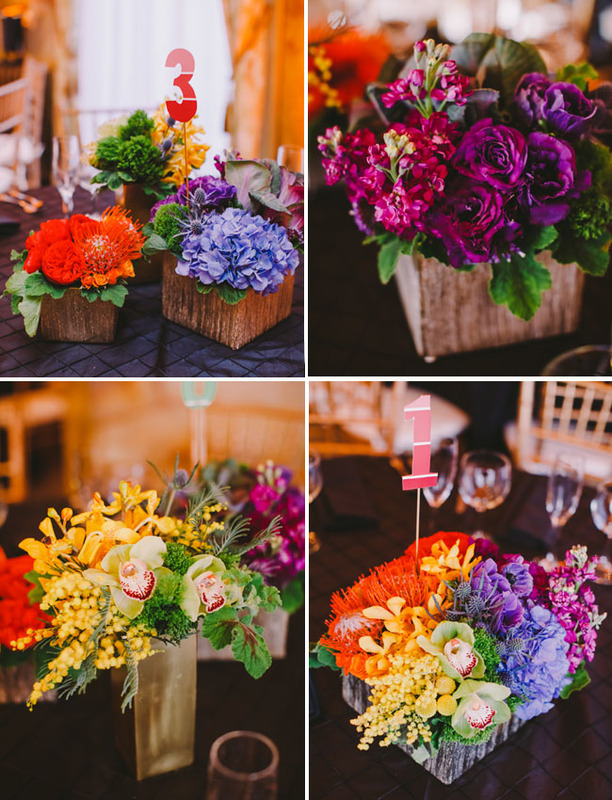 I offer some ideas on how to use rainbow colors in many ways from wedding attire to the reception. The colors of the rainbow are red, orange, yellow, green, blue, indigo and violet. Why not keep a notebook ready and write down ideas as they come to you when you begin planning for the big day? You can then go through them and see what you want to incorporate into your wedding day. 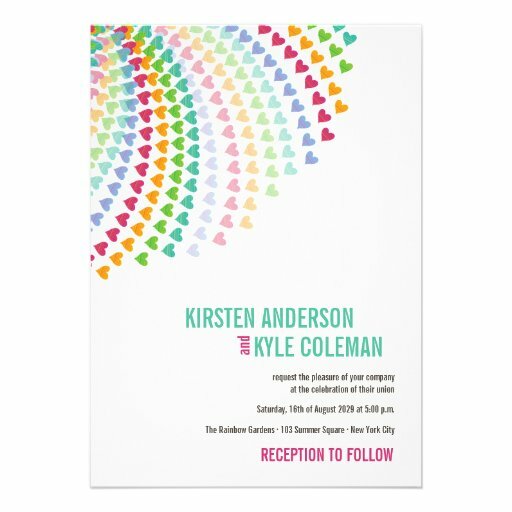 Have your invitations done on a muted rainbow themed paper, do check out the internet for great looks and ideas. Your wedding program is a fine way to continue your rainbow theme and again check the internet for ideas to help you. This will be your way of letting your invited guests know what the theme of the day will be. As the bride in your beautiful dress you will have all eyes on you as you start your walk down the aisle. 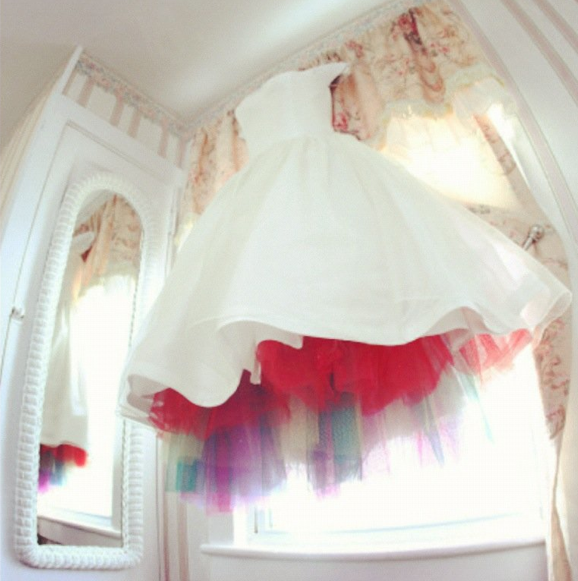 Think about the traditional white dress with a multicolored crinoline underskirt or a rainbow colored sash at the waist of a white dress would also be stunning. Be really non-traditional and wear a dress in the rainbow colors. Choose your favorite rainbow color and wear that in a solid colored dress. Your bridesmaids in rainbow-colored dresses with lovely matching bouquets will certainly breath life into your rainbow theme. Another ideas is to have your maids in a sky blue dress and carry rainbow colors in their bouquets. 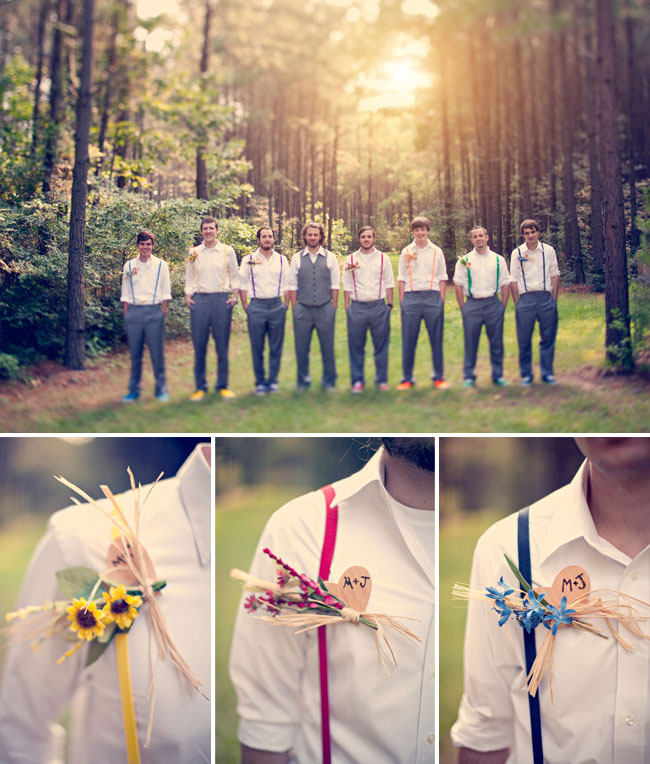 The groomsmen can continue the theme with the wearing of colorful ties and socks or cummerbunds. 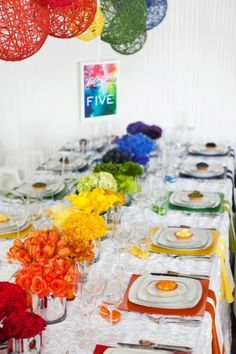 Your wedding reception is the place to really have fun with a rainbow theme. Let me suggest some ways to use your theme in an effective and lovely way. Colorful ribbons or streamers hung from the ceiling over the dance floor to section it off in a very pretty way. 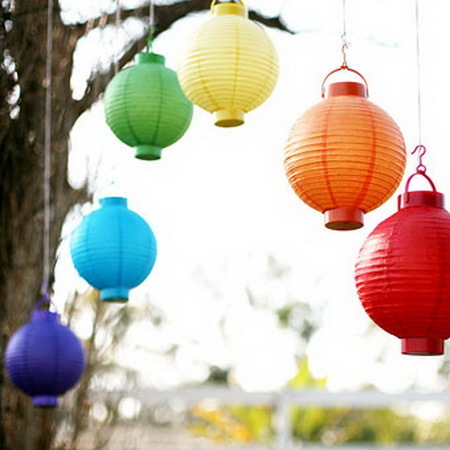 Paper lanterns in rainbow colors as hanging decor. Rainbow colors in solid table napkins with rainbow graphics. Strings of colored lights or change the light bulbs to rainbow colors to accent certain areas. These are some of the things you might choose from and then again let your creative side run wild with this theme. For a more traditional favor candy in bright rainbow colors in clear packaging is an inexpensive and cheerful gift. You can look for rainbow images on coasters or candles. Have cookies made with the rainbow design on them and package with a packet of coffee or tea. Look for key chains, photo frames or magnets with rainbow symbols or buy solid colored items in the colors of the rainbow. Here is a suggestion for themed food you can serve and it is rather simple, too. Try stringing fresh fruit on skewers in some of the rainbow colors for your guest to enjoy. The same thing can be done with veggies and accompany them with a couple of dips. 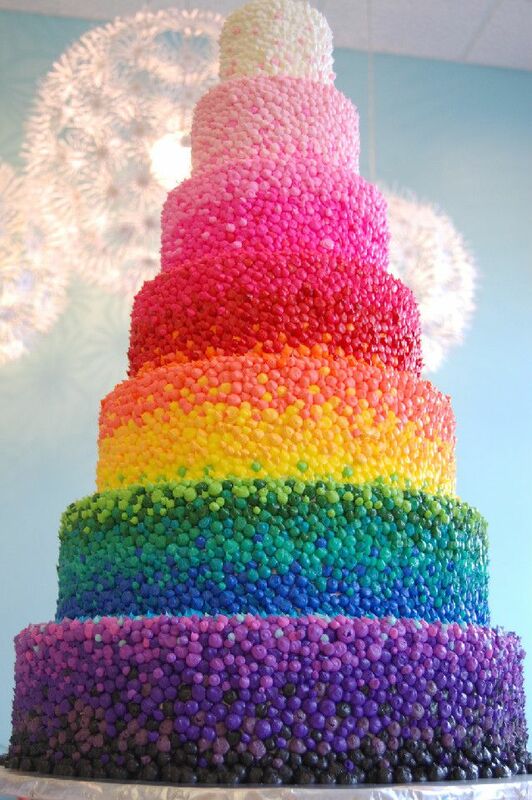 Do a rainbow sweets table with colorful cupcakes, cookies, popcorn, jelly bean or gumballs. Just whatever you want to add for a tasty treat for all to enjoy. There are so many choices for you when deciding on your all important wedding cake. Limitless ideas can be found on the internet and ask your local bakers for photos of things they might have done. It can be whimsical, elegant and anything in-between when you have chosen this lovely theme. As you step out on to the floor to have your first dance as husband and wife make it to the strains of "Somewhere Over the rainbow" and enjoy the romance and the love of your life. You will be so happy that you chose a rainbow wedding theme and so will your family and guests.